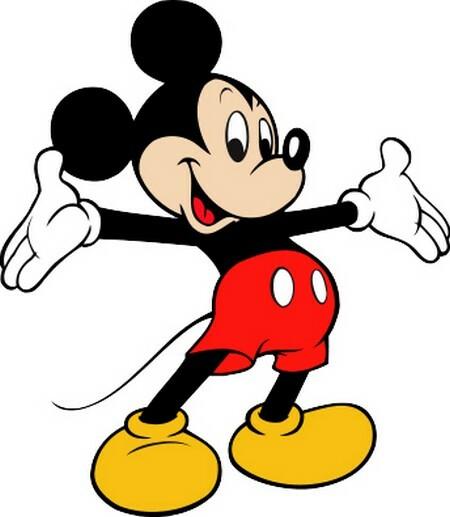 Mickey Mouse is a cartoon character of a talking mouse owned by The Walt Disney Company. It was created in 1928 and it is a very strong franchise for the company as well as its main character for promoting the company’s television channel, various Disney theme parks and merchandising opportunities. The figure of Mickey Mouse is distinctive and quite unique among cartoon characters with large black ears and a pointy nose, red shorts with white buttons and large yellow construction boots, the shape of Mickey’s ears and nose are the logo of The Walt Disney Company. The origin of the Mickey Mouse is clouded in history with different stories appearing to suit the urge of publishers, copyright holders and those looking for a mystery, with all of the original parties to its creation having passed away, we may never know the real truth. The Walt Disney Company claims that the character was of course created by Walt Disney (1901-1966) himself who was also the founder of the company and that Walt had based his original drawings on the humanized behavior of a mouse. Walt adopted this in the early 1920s while he was living in Kansas City and working for the Kansas City Film Ad Company. Walt recollected in later interviews that he drew a series of sketches of a cartoon mouse and his long time friend and colleague Ub Iwerks reworked the sketches into a form that would make the character easier and quicker to draw by simplifying the character into a series of curves and straight lines. Walt provided the voice, attitude and personality of Mickey Mouse, this lead many of Walt Disney’s animation colleagues of that time to describe Walt as the real life father as well as the rightful designer of Mickey Mouse character. There is an opposing story which tells that a mouse character had originally been drawn by Hugh Harman around a photograph of Walt Disney in 1925 and that these were later used as the idea for a new character when Disney went his separate ways from Universal Studios where he was contracted to provide shorts based on a character named “Oswald the Lucky Rabbit”. Disney needed a creation of a new character since he had signed over the rights for Oswald to Universal, because of this he asked his friend Ub Iwerks to come up with some unique ideas, some of which included cats, dogs, horses, cows and frogs. Iwerks was lucky and nearly at his intellect that he remembered seeing Harman’s mouse sketches around the photo of Walt that both he and Walt Disney finally agreed they were on to a winner with a mouse character with big ears and wearing a pair of shorts. They imagined the mouse being human like, a bit of a struggle against whom fate had always set a challenge and which he would overcome through effort, good nature and patience; they named their character Mortimer Mouse. Mortimer mouse struggled to find an identity, Walt’s wife Lillian had convinced that the name was a bit arrogant and would detract from the character’s audience appeal. Walt wanted his new studio’s primary character to be lovable, cute and little with traits he believed would made it easy for children to fall in love with. In a later interview, Walt credited part of the personality of Mickey Mouse to Charlie Chaplin who was a cute lovable character with no fault of his own always seemed to be getting into trouble. Mickey Rooney said that Walt disclosed he chose the name Mickey after seeing Mickey McGuire who was a character played by the young Mickey Rooney in the early 1920s. The first Mickey Mouse short was ready for distribution by May 1928, it was entitled Plane Crazy and it featured Mickey and Minnie Mouse and a plane that Mickey had built. The short showed that Mickey invites Minnie for the first flight and after takeoff attempts to kiss Minnie who jumps out of the plane with a parachute leaving Mickey to his adventure; this was of course filled with mishaps. The short failed to find a distributor so a second short, The Gallopin’ Gaucho was filmed and introduced Pegleg Pete who had been previously seen in other Disney animations as Mickey’s rival for Minnies affections, this short too failed to find a distributor. The Gallopin’ Gaucho was an unusual production in which Mickey was seen in two different designs. In the beginning of the short he was looking like he did in Plane Crazy, notably with a black face and white eyes with black pupile and in one of the cantina scenes Mickey is showing his teeth while smoking a cigarette or drinking a beer. Coincidentally at the time Mickey rescues Minnie from Pete and becomes her hero, his appearance changes to a white face with solid black eyes. Because of this, charges of racism have been leveled against this animation but were never sustained in a court. The first Mickey Mouse animated short which was successful in finding a distributor was Steamboat Willie, released in November 1928 and again featuring Mickey, Minnie, and Pete who appears as the captain of the boat. Mickey himself appeared closely resembling the Mickey who became the hero in Gallopin’ Gaucho. Steamboat Willie proved an immediate hit with audiences loving the use of music and sound effects that added humor to the production and encouraging Disney to fully adopt sound in all animations including Mickey’s first spoken words in production of The Karnival Kid in 1929. In late 1929, a minor change occurred to Mickey and Minnie’s appearance, the characters sported a smart pair of white gloves which were added after complaints that viewers couldn’t see what they were doing with their hands when facing the camera. At that time all Disney animations were still being filmed in black and white so white gloves allowed the hands to contrast with other black parts of their bodies. By the early 1930s Mickey Mouse had overtaken Felix the Cat as Americas favorite cartoon animation and Mortimer Mouse had been introduced as rancher uncle of Minnie Mouse. A new animator at the Disney Company redesigned Mickey Mouse In 1935, it returned the white eyes and black pupils but also shortening Mickey’s nose and giving his body a makeover converting the round torso to an ellipse and Mickey’s face was also made wider in addition. The 50th anniversary of Mickey Mouse’s first short film being produced and distributed in 1978, The Walt Disney Company organized a huge extravaganza at Disneyland in California with shows and some of the largest fireworks displays ever seen at that time. Mickey was also awarded a star on Hollywood Boulevard, and it was the first cartoon character to ever receive a star. 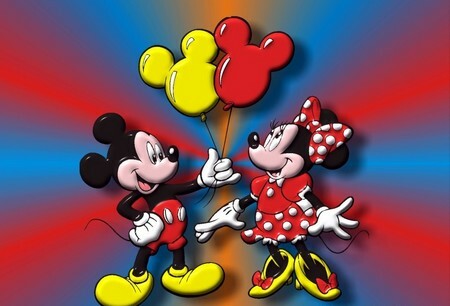 The Disney Company was also operating Mickey Mouse Clubs in cinemas throughout the US claiming over a million members, for whom specially discounted prices of Mickey Mouse merchandise were available; the members would also receive coloring books and badges. The administrative costs of managing these proved uneconomic by the mid 1930s and they were closed down. Again from 1955 to 1959, the Mickey Mouse Club was revived as a television series which was broadcasted from Monday to Friday. The Mickey Mouse Club was also aired in the 1970s and then again in the 1990s with many famous pop celebrities getting their first broadcasting role as cast members of the revived show, among them was Christina Aguilera, Britney Spears and Justin Timberlake. A new format show named the Mickey Mouse Clubhouse began airing In 2006 however the show was aimed at preschoolers and was not a successor to the Mickey Mouse Club which The Disney Company reserves the right to revive.